Looking for a smartwatch that well, looks like a watch? Motorola was the first to accomplish this with the Moto 360 and its still one of the best options available. The moto 360 is the first circular watch to run android wear. In general it is a way to receive notification without pulling your phone out of your pocket. It can also be a very nifty fitness tracker and a pretty decent watch. In short its google now on your wrist. This isnt a stand alone watch. if you are looking for a watch just to be a watch you may want to look elsewhere. The moto 360 also isn’t the Power Ranger intercom that we always wanted from the 90’s so no you can’t make a phone call from it and talk to your wrist. “Moto 360 Stays true to the timeless form of the classic wristwatch. A round design maximizes the display area, while ensuring a comfortable fit. People who don’t own the watch seem to complain about the flat tire look of the circular display, and honestly I did as well. I can gladly say now that it really isn’t an issue. It really does disappear and you won’t notice it after a hour or two. Like most devices it is normally hit or miss depending on how you use it. In ambient mode i got like 12 hours with moderate use. Ambient mode off I get like 18 to 20 hours. Stuff like Navigation will drain your battery way faster. This can most likely be fixed via google maps update. but we’ll have to wait and see. Before the most recent update, Performance would chugg every now and then. That isn’t really the issue now. 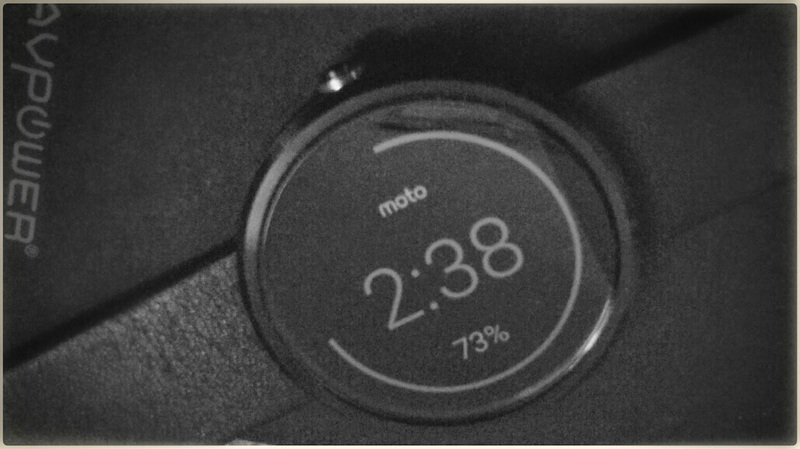 The Moto 360 works just as good as any other smartwatch out there. Motorola hit the sweet spot where price is concerned. 250 for the base model is just right if you ask me. Actually I predicted that it would cost this. I remember after it was announced people were arguing with me on the internet stating that, this is a premium device and it will come with a premium price of 350+. Honestly why would anyone pay more for a phone accessory than they do for a actual phone? It isn’t exactly a designer timepiece like a Rolex, Citizen, or Movado watch either. In the end 250 was the right prices. I have had my Moto 360 for 3 months and thought that I would eventually regret my purchase. In reality its kind of the opposite. Once you realize what android wear is for, everything just sorta flows. If works out really good for me because I really can’t just pull out my phone while working on the job, yet i get all my notifications at a glance. I can also respond to texts, etc. Navigation is so much easier when you don’t have to look away from the road or have a robotic voice interrupt your music. Directions on your wrist is a awesome idea. Android wear was made for fitness and it works really good via the Moto 360, though i wish you can have all the features you get on the watch available on your smartphone (google fit stats, moto body stats, checking heart rate, etc.). Android Wear will continue to grow with updates and i hope the Moto 360, will continue to improve as well. If you want a smart watch and don’t want to spend a mint on the incoming apple watch, the Moto 360 is still readily available. Android Wear will soon support iOS too so apple users can also enjoy it.